Lorraine has been a dancer all her life, training at The Royal Ballet and working professionally in film, TV and The West End. In 2001 she discovered the challenge of Bikram Yoga, keeping up a regular practise to realign her body and soothe aches and pains, after dance rehearsals and performances. Discovering new ways to stretch and strengthen her muscles was the first attraction, but over time she became more self aware and thrived being in such a welcoming and friendly environment, where no one was there to judge. 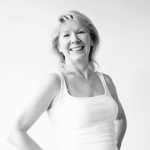 Bikram has kept Lorraine injury free, strong minded and spiritually sound. 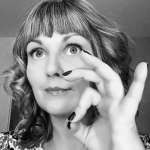 Since qualifying as a teacher in 2009, Lorraine has taught in London and Los Angeles. She loves teaching and sharing her passion and enthusiasm for Bikram Yoga with her students. I moved back from Germany at the end of a contract and was out of work and needing to keep in shape and keep my spirits up for auditions. I practiced regularly and fell in love with the post-class feeling. Reading minds, so I could catch my students attention as they drift off into their heads during yoga practice! Most embracing moment while Teaching? My very first class back from training. I’d flown back from the states and turned up early to the studio to prepare. I wasn’t feeling well and everyone thought it was nerves. It turns out I actually had food poisoning and began the class, but had to make a quick exit after Eagle, handing the microphone over to another teacher to finish! Fish and chips… I’m still a northern lass at heart! Bikram to kick-start the day, followed by a brunch of eggs on toast. A saunter around the market, coffee & fresh air. Perhaps a walk in the park. I love the movies in the afternoon, ending the day with a dinner either out or at home with my husband and friends. What did you do before you worked at BYC? Professional dancer. I’m still going and combining it with my Bikram teaching. Right now I’m working on the new Disney film at pinewood studios “Cinderella”, directed by Kenneth Branagh.